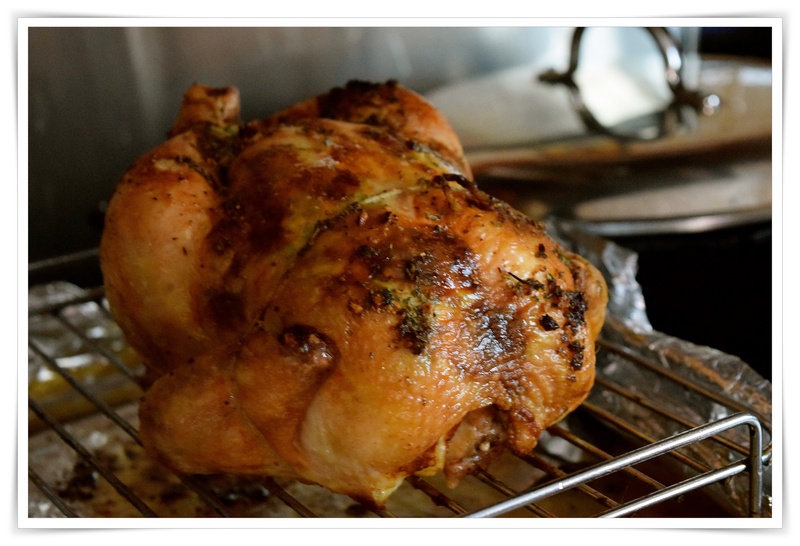 I love roasted chicken especially a buttery, herby juicy one nothing better with a pile of roasted fingerling potatoes and a side of skillet corn, perfect Sunday dinner and then a good amount leftover for another fantastic dish. 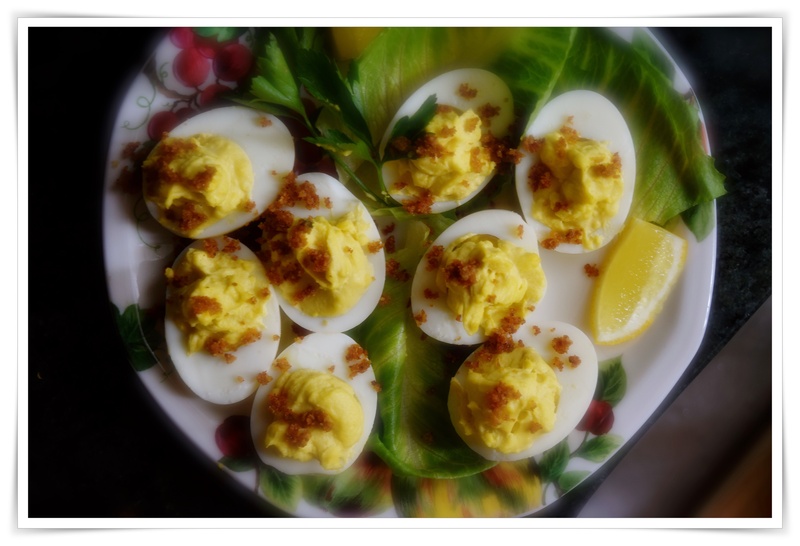 I also made a nice plate of Caesar salad deviled eggs a nice twist on classic deviled eggs with all of the traditional Caesar ingredients into the filling and then topped with crispy toasted bread crumbs…new, different and delicious. Finely chop all of the herbs and add to the softened butter, smooth with a fork to throughly combine. Gently separate the skin from the meat of the chicken (look at a YouTube video for instructions if you are not familiar with this process). Stuff the butter blend under the skin, put some inside the chicken cavity and finally slather the butter all over the chicken. 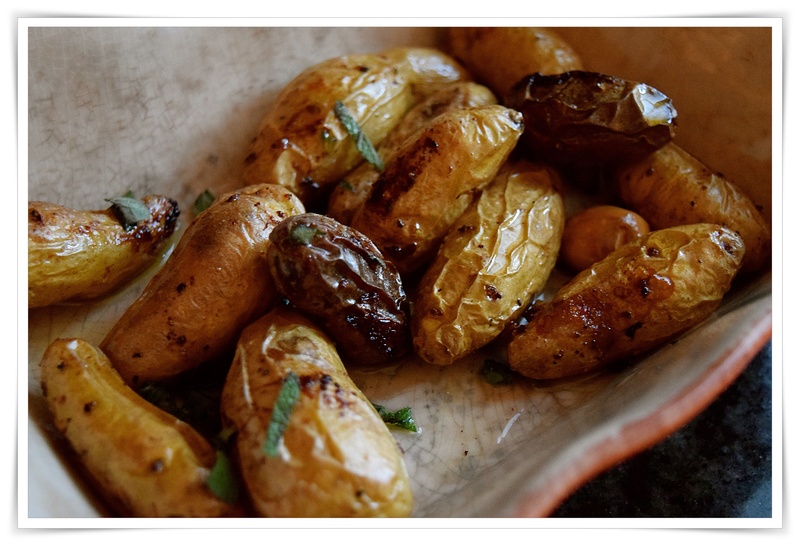 Season with salt and pepper, roast at 400º for 20 minutes, lower heat to 350º and roast for another 20 minutes or until golden. Use a meat thermometer to test for doneness and if you need more time check again in another 5-10 minutes. Remove chicken to platter and allow to rest for 5 or so minutes…if you have lots of unburned pan goodness, deglaze with white wine or chicken stock for a little pan sauce. A note here, my roasting rack was high enough to place the small baking dish filled with lightly oiled and seasoned fingerling potatoes just under the chicken to catch some of the chicken juices. Knowing that I could easily slide the rack aside to remove the potatoes if they were finished before the chicken was done which was the case with these little colorful potatoes was a good move, but if you have larger potatoes you can roast along with the chicken taking into account the cooking time for your particular variety adding potatoes 20 minutes or so into the roasting time.